While only 12 years old, it seems like Cameron Manor has done it all! 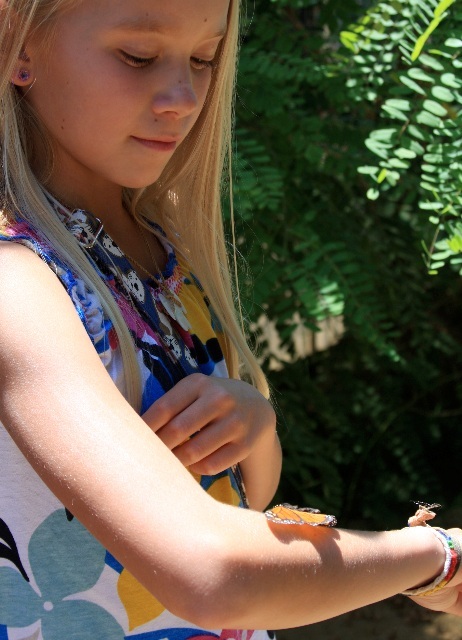 She is the Butterfly Caretaker at the Environmental Nature Center (ENC) in Newport Beach, creates fun educational videos about science, makes and delivers free cupcakes to the elderly, and a story she wrote was published in Stone Soup, an international kids’ magazine! Through all of her hard work she was even named a Discovery Girl’s role model! Cameron is doing such a wonderful job in making a positive difference in the world that we are honored to name her as our next Amazing Kid! of the month. If you are looking for a way to get more involved in your community, Cameron’s story is just perfect for you! 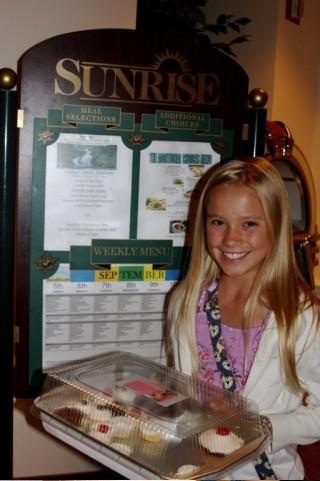 Cameron first started raising butterflies when her mother let her get her own butterfly growing kit. After mailing in for the butterflies, Cameron received five black caterpillars. “They were as tiny as silvers of thread,” said Cameron. A painted lady butterfly Cameron raised. 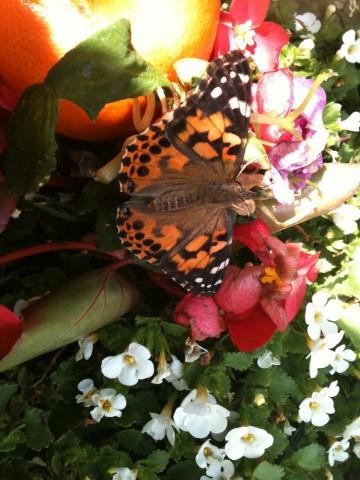 One of Cameron’s favorite parts about raising her butterflies was decorating the bottom of the cage with flower petals and freshly sliced oranges so the butterflies could eat. For anyone wanting to attract their own butterflies, you can attract butterflies by planting “herbs, flowers, and trees such as milkweed, dogbane, cow parsnip, fennel, dill, cottonwood, wild cherry, willow, maple, alder, birch, gooseberry, currant, wild rhododendron, cabbage, mustard, nasturtium, thistle and pearly everlasting. Each flower and plant attracts its own butterfly, so your garden is a recipe for color,” Cameron relates. Over the last six months Cameron has hatched over seventy butterflies. Her love and experience with nature helped her become the new butterfly caretaker at the Environmental Nature Center (ENC). Right now since the butterfly house is under construction Cameron has been mostly weeding and ridding the place of wasp eggs. She has also been growing milkweed in a separate greenhouse so butterflies don’t have to compete with ants to get nectar. Not only does Cameron have a love for nature, but she also has a love of science. And the coolest thing is that she is using her knowledge of science to make fun educational videos for others. Cameron’s first science video was made for a contest on Discovery Kids. “Because of my interest in science, my first video was about interesting facts about germs,” Cameron explained. A mixture of Cameron’s service projects, blogs, films, crafts, personality and continent-wide vote helped her get named one of Discovery Girl’s top twelve role models! “Discovery Girls is a preteen magazine that chooses 12 girls in a different state every month to write the content for and be featured in the magazine’s photo shoots,” Cameron explained. One of Cameron’s favorite things to do is to write. “Anything can happen as I create worlds out of ink and paper. Her writing even made it into an international children’s magazine! 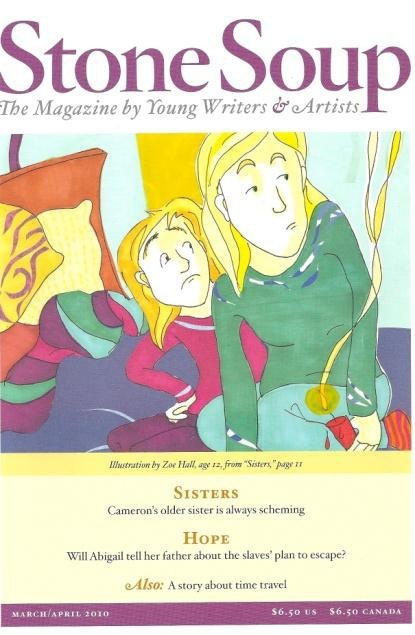 Cameron’s story about her and her sister was featured in Stone Soup Magazine. The cover of Stone Soup Magazine, featuring Cameron’s story. From raising butterflies and writing, to baking cupcakes for the elderly, Cameron sure knows how to make a difference in the lives of others! We are so proud of everything Cameron has achieved and we can’t wait to see what is in store for her future! Congratulations, Cameron, on all of your truly amazing accomplishments! Amazing Kids! is proud to feature you, such a great role model for your peers, as our August Amazing Kid! of the Month!